Electro Optics is the leading resource for entrepreneurs, engineers and researchers involved in photonics business, technology and applications. Registered readers have access to news of the latest technological developments, trends and opinions in the photonics industry as well as independent, in-depth editorial content. Electro Optics provides uncompromised, informed commentary and analysis on topics of interest to anyone involved in the photonics industry. Following the acquisition of Optics and Laser Europe in 2011, Electro Optics is now the only pan-European audited title serving the photonics industry. Its targeted controlled-free circulation provides photonics suppliers with an ideal platform on which to promote their products and services. 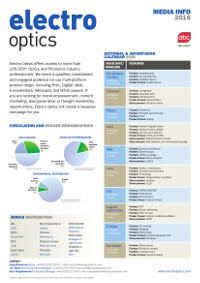 Electro Optics is published 10 times a year, and is available free of charge to qualifying individuals in both print and digital format. Marketing options include display advertising, outserts, and inserts, as well as enhancements to the digital version, such as video overlay. 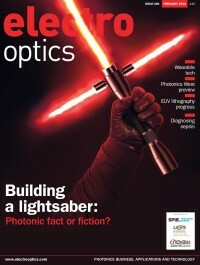 As well as showcasing all the magazine content, www.electrooptics.com features pages of web-exclusive news, products, white papers, analysis and opinion, case studies, event previews and webcasts. Alongside traditional banner advertising, marketing options include white papers, sponsored content, and webcasts. There are two regular email newsletters: EONewsline, a monthly round-up of the latest news, event previews and more; and EOProductline, showcasing the latest in new technology. Marketing options include banner advertising, sponsored content, and product showcases.